When I mentioned I was going to spend Christmas photographing Juárez, people reacted as if I was planning a trip to Somalia. They were not that far off. How out of control is the city of Juárez? Compare the killings there to the war in Afghanistan. 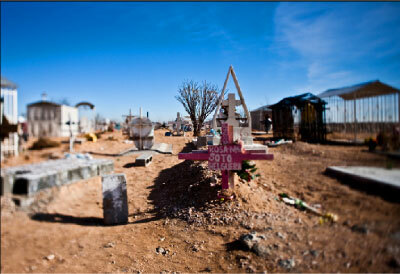 In Juárez in 2009 — a single city with only 1.5 million people — almost 2,600 people have been murdered. The number of civilians killed in 2009 in the war in Afghanistan, a nation of 28 million people, was about 2038. In the last two years, upwards of 4,000 people have been murdered in Juárez, compared to about thirty homicides across the U.S. border in El Paso. Juárez is the deadliest city in the world for a simple reason: for years, several powerful drug cartels have been fighting over control of the city. The region represents an extremely profitable route into the U.S., where consumers spend enormous sums of money to get high. On average, ten people are murdered each day. In September alone, 476 people were killed, most of them gunned down in the street in broad daylight. Juárez has become synonymous with murder, but the murders here are extraordinary brutal.